Alspec® offer a wide range of Window and Door Grille options that will improve the security of your home. Alu-Grille® are perfectly suited to a wide range of window applications as well as both hinged and sliding doors. Finding the right balance between appearance and performance is not always easy. Alspec's® wide range of designs and proven quality ensure security requirements for any home can be met. All products are custom made to enhance the design of your home. 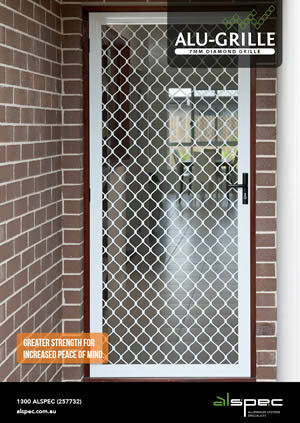 Alu-Grille® have a 7mm strand thickness and meet the requirements of the Australian Security Door Standard AS5039. To obtain maximum benefit from Alu-Grille®, all doors made incorporating these grilles should also be manufactured to comply with AS5039 and installed to comply with AS5040. Alu-Grille® Doors are available with the option of One Way Mesh, ideal if added privacy is required. One Way Mesh allows you to see out through your door at the same time as reducing the visibility into your house from the outside.